Where in the UK are the majority of people searching online for information about drought, climate change and flooding? We conducted a small study of trends in Internet search terms over the past 10 years to highlight patterns and relationships in levels of interest in drought, climate change and flooding. For example, over what time-scales are people searching for information and which search terms are they using? Information on the volume and trends of searches can be found on search engines. We used Google to provide a quick overview of the timings, locations and topics searched by people. This type of information is important when exploring people’s perceptions of UK drought and interests in water use. When did people search for climate change, drought and flooding? Figure 1 The search interest over time for the terms: drought, climate change and flooding from April 2004 (when the data became available) to February 2015. The bar heights represents the average of all points on the graph for that search term. From April 2004 until February 2015, searches for climate change were on average higher compared to drought and flooding, which were related to specific time periods. The highest peak searches for flooding were in December 2013-February 2014. The Hydrological Summary for the UK, reported that February 2014 was “exceptionally wet, thus bringing to a close the wettest winter in the England & Wales rainfall series (from 1766). During the winter of 2014, the BBC also captured images 10 key moments when the storms were most extreme across the UK. The data confirms that the volume of searches increases when flooding becomes an emergency particularly, when rivers have reached high levels and homes and businesses across the country have been flooded. Searches related to drought peaked in July 2007, January 2008, November 2009, January 2011, and September-December 2012. A report from the Centre for Ecology and Hydrology described the summer 2007 floods as a singular flood event: this report recognises that “the 2007 flooding was remarkable in its extent and severity and truly outstanding for a summer event”. The floods followed the prolonged drought from 2004-2006. In such cases, people interested in drought might demonstrate worries about the alternation between weather conditions and the severity of extreme weather events. In turn, water shortages which occur after a flooding event may also represent contradictions. However, interest in drought is usually higher when water scarcity becomes persistent, for example, in 2012, the drought was severe from early spring and hosepipe bans were enforced in the first week of April, affecting 20 million consumers. Interest in drought was fairly low until 2006 and increased over time when debates about climate change began to enter the public sphere. Peak interest in drought was higher on the 14th of May 2006 compared to interest in climate change and flooding, during a time when a drought order was granted in England and Wales for the first time since 1995, banning the non-essential use of water. Where did people search for climate change, drought and flooding? From 2004 until 2015, which regions and cities in the UK showed the greatest interest in drought, climate change and flooding in the UK? Drought interest was higher in England (100 maximum value), followed by 88 in Wales, 65 in Northern Ireland and 64 in Scotland. Searches for climate change were highest in Wales (100 maximum value), followed by 85 in Scotland, 83 in England and 58 in Northern Ireland and interest in flooding was highest in England (100 maximum value), followed by 95 in Wales, 69 in Northern Ireland and 64 in Scotland. 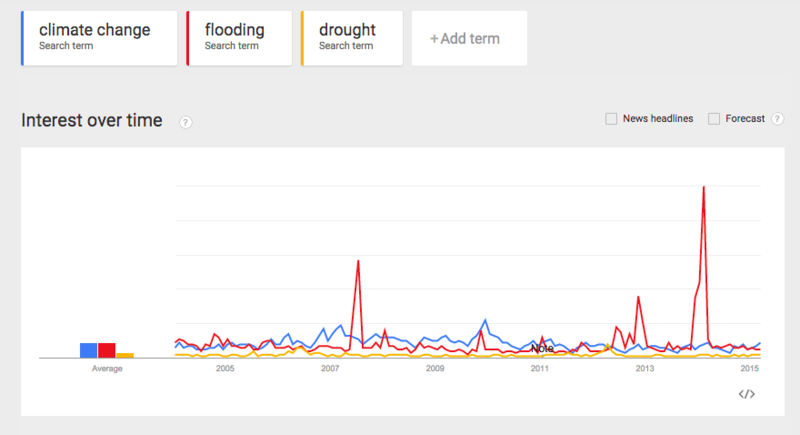 Search interest was related to key drought or flooding events in particular cities. Interestingly, the same cities were also mentioned for searches on flooding and climate change suggesting that the key linking factor may be “water use” which in turn is related to specific floods or drought events in these areas. Drought and flooding also both form part of the broader discussion surrounding climate change. Farnborough, in England, showed the greatest interest in drought as well as high levels of interest in flooding and climate change. In February 2013, the local council in Farnborough reported that thousands of homes were at risk of flooding and, in December 2014, flood prevention funding was announced. At a global level, considering the 196 independent countries in the world today, the statistics show that the UK is ranked 14th in the list of countries with the highest level of regional interest about drought and 3rd for the country with peak interest about flooding. No British cities were ranked as the top 15 cities with a peak interest in drought worldwide however Edinburgh (10th), London (12th) and Manchester (15th) were ranked in the top 15 global cities for peak interest in “climate change” and London (7th) and Birmingham (9th) for flooding. 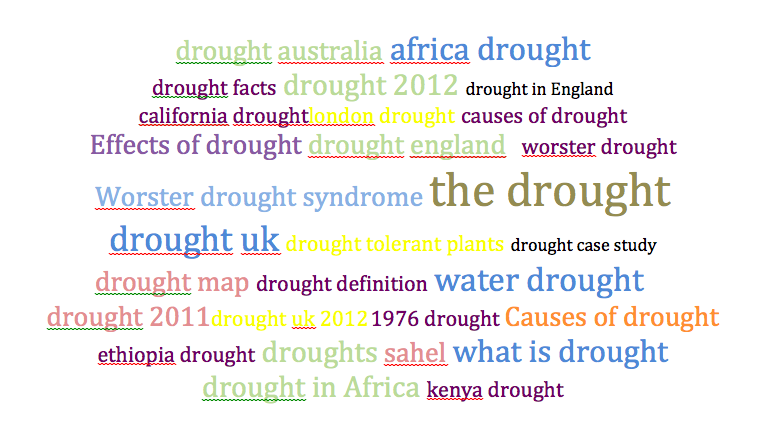 What terms did people use when searching for drought? Top searches for drought in the UK identify popular search terms. These terms are of interest to our study because we are interested in how specific key words, search terms and phrases are used on social media platforms and collectively compose a narrative of UK drought. By exploring the data on Google Trends we are unable to specifically identify how our project or other drought and flooding research projects influence the statistics or how many people wanted to find out about droughts which happened in the UK. To go deeper and understand people’s perceptions of these issues, other types of data must be collected. We are currently, working on a sentiment analysis of the tweets and posts shared by users on social networks such as twitter. We are also developing a database where we will be able to analyse and query all the posts where people mention drought and water scarcity. After having understood in short what people search on the web for climate change, drought and flooding, we are going to understand more in detail what people know and how they talk about “water use”, more broadly. The numbers do not represent absolute search volume numbers, because the data is normalised and presented on a scale from 0-100. Understandably, the statistics at a global level reflect a higher volume of interest in the larger cities in the UK.